We continue to develop our relationship with the West Oakland Farm Park run by City Slicker Farms. 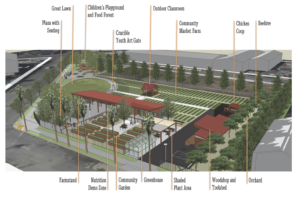 The Farm Park was opened in 2016 to further their mission of providing access to and education about healthy and affordable food. Programs include Backyard Gardens, Community Garden, Farmstand and Nutrition Demos, Farm Tours, Youth Crew, Work Days and more. The Farm Park is located within 5 minutes of our club meeting site and so far we have participated in 2 projects there: Farm Park Exploration and Butterflies, Bees and Other Pollinators. We hope to deepen our relationship with the Farm Park so we can offer our members unique opportunities to engage with their community and strengthen their connection to where their food comes from.